A Clamp-on Tee fixing with a single bolt that will make a 90 degree bolt-on joint. This part is often used to make additions to existing structures when you can?t fit the Short Tee Connector, or a similar part. The through tube, shown as horizontal in the image, cannot be joined within the fitting. Dimensions in image are millimetres. 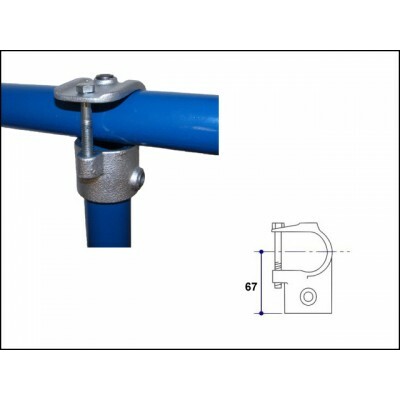 Part JWICL136, Clamp on Tee (2 Bolt), is a similar fitting that will offer a more flush finish.